Designed with a Las Vegas theme in mind, the Prime Casino has made a name for itself as a great place for people looking to play only the hottest games around. 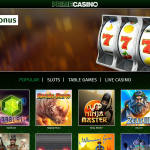 This Prime Online casino review includes a few important topics about the casino that relate to not only the games offered here but also for how it has several ways for people to get more money off of the site. 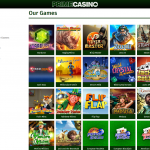 This gaming site has been in operation since 2007 and is owned by Prime Gaming Casinos. This makes it one of the oldest ongoing online casinos for players to visit today. Also, while the site is licensed in Malta, it focuses much of its work in Canada, Scandinavia and Russia. It even offers the Russian ruble as a currency option, a choice that is not very commonplace in today’s online gaming world. The slots are varied in terms of what’s offered. Various new games are added on occasion. A few of these games are made with big jackpots. The Mega Moolah game is especially famous for how it offers jackpots worth a million euros or more. For card game fans, there are four options to play with. Players can enjoy American or European blackjack variants as well as baccarat and Punto Banco. There are three roulette games to play. The American, European and French roulette games are all included here. Three video poker variants are also included. These are the Aces and Faces, Jacks or Better and Deuces Wild games. There are also four live games to play here. These include the live roulette, blackjack, baccarat and hold’em poker games. These are subject to availability based on whether a live dealer is on hand to get these games up and running. For people aiming to get free money to play games with, there is one bonus point to see. The welcome bonus is available for new players with a total of up to €100 in free money. This works when the promo code “150spins” is used. With the bonus code, a player will get a 100% match bonus of up to €100 on that first deposit. Still, while the promo code suggests that a player will get free spins at the place, there is nothing on the Prime Casino website that says the player will actually get the 150 spins the code says. Still, the money from the bonus can be used on all the slots available. All bonuses must be wagered at least 30 times before a player can take out any money off of it. The games that are officially covered by the bonuses are varied and should be checked before a player gets online to do anything with the money one has. Players at the casino will enjoy playing games on a variety of software programs. 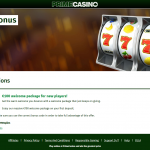 Prime uses Amaya, Aristocrat, Microgaming, NetEnt and WMS software programs among others. These are used to create a more entertaining overall experience. The site does have an instant play option as well as a download choice. The download option allows the player to get a dedicated client on one’s computer. This offers more of the games that the site promotes. This is a popular feature but it does not have any mobile formats at this moment. This casino supports a good number of currency options. It supports the Euro, American, Canadian and Australian dollars, British pound, Norwegian, Danish and Swedish kronor and Russian ruble. It also supports the South African rand, another currency that is not supported on a good number of online gaming sites. There is an extensive variety of deposit options for players to check out. The site lists such prominent options as MasterCard, Visa, Yandex, Entropay, eWire, Skrill and Neteller among a vast number of other online transfer systems. Some of these payment options are only available in certain countries though. Withdrawals are handled by some of the options with people requiring a few business days to get their particular funds out. The terms vary by each option and should be compared to be certain. The support offered by this site is available 24 hours a day. Telephone support is available as is email support. The company also has its own address although it is listed in the British Virgin Islands where the company is headquartered out of. The support team also insists that people send in their requests for help in English as it will be easier for them to get the help they are looking for when they do this. Also, the casino does have a +44 number, thus meaning that a player would get in touch with a United Kingdom number for any kind of phone queries that one holds. Live chat is available for customers to use as well. Again, this is a feature that works best when the person asks for help in English. Although the site does try and encourage people to get their queries out in English, the casino itself does at least work with a good number of languages. People can get on the site in English, German, French, Spanish and Italian among other languages. It even has support for a few languages that typically are not found on such places including Greek, Turkish, Romanian and Hungarian. 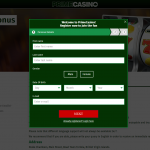 As this Prime Online casino review shows, the excitement of this great online spot for gaming is all around. This place has numerous ideal games for all to play. The promotions are relatively limited in terms of what is available but the site in general still manages to offer plenty of quality features to make it stand out from the rest of the pack. Be sure to check this place out if you are looking for a fun spot to enjoy great online casino games at.